These four toddlers with their feeding bottles and dummies can be found every afternoon having fun at Rainbow Nursery, either learning their ABC's, dancing, listening to stories or music. 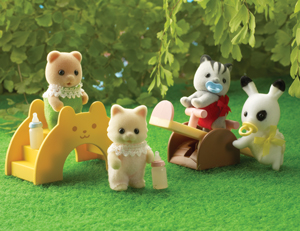 Set includes Appleblossom grey squirrel baby, Blackberry rabbit baby, Honeybear tan bear baby and Chantilly cream cat baby. Seesaw & slide not included.